Parakarry in Paper Mario: The Thousand-Year Door. Parakarry is Mario's fourth party member in Paper Mario. He is a cyan Paratroopa and is the Mushroom Kingdom's primary mail carrier, delivering Princess Peach's party invitation to Mario and Luigi. It is this letter that starts the events of Paper Mario. He, along with Corporal Paraplonk, Koops, and Holly Koopa are the only Koopas that have shoes that are a different color to their shells. Parakarry works for the Post Office in Toad Town, the capital of the Mushroom Kingdom; his boss is the Postmaster. 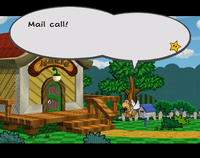 Parakarry tends to be quite clumsy and often loses the letters he is supposed to deliver, and it is also noted in-game that he is rather slow at delivering mail. As such, there are quite a few pieces of undelivered mail scattered across the kingdom. 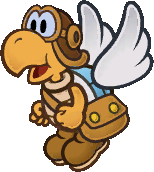 Parakarry's name is a portmanteau of "Paratroopa" (or perhaps the alternate "Para-Koopa", as his name features a "K") and the word "carry", as he is a mail carrier whose ability involves carrying Mario. In Paper Mario: The Thousand-Year Door, Yoshi has the same ability as Parakarry, to carry Mario over gaps that he can't jump over. Mario first meets Parakarry on Mt. Rugged (though Mario can optionally find him standing in the Post Office earlier in the game, before Chapter One to be specific). Parakarry explains to Mario that he has lost three Letters and asks Mario to retrieve them. After Mario recovers the Letters and returns them to Parakarry, the Paratroopa joins Mario's party seemingly out of both thanks and as a wish to assist Mario in finding all of his other lost Letters. Outside of battle, Parakarry can carry Mario for a short amount of time, flying over gaps Mario cannot Jump over. With Parakarry on his team, Mario can also deliver the Letters he finds by talking to their recipients with Parakarry out on the field. Parakarry has a Defense Power of 1. He also receives two letters at the Post Office in Toad Town: one from Frost T. thanking him for delivering his letter, and one from Whacka who admires his ability of flying. He's a mail-carrying Paratroopa who's looking for lost mail. Press to have him carry Mario for short distances. While he's carrying Mario, press again to put him down. He can deliver letters to recipients all over the world. His specialty is attacking airborne enemies. Parakarry makes a cameo appearance in the beginning of Paper Mario: The Thousand-Year Door. Like the previous game, Parakarry delivers a letter to Mario from Peach, and yet again another adventure starts. Because this opening scene was near-identical to that of Paper Mario, Parakarry's appearance is likely just a small part in a larger reference to that game. He is never seen again in the game. In Super Paper Mario, Peach does not send a letter to Mario to begin the story, so Parakarry does not appear at the beginning scene of that game. Toad takes his place by just alerting the Mario Bros. that Princess Peach was kidnapped. However, he does appear on a portrait with all of Mario's partners in Mario's house, as well as on a Catch Card found on the fiftieth level of the Flopside Pit of 100 Trials. There is also sprite data for him inside the game, but it is never used. Parakarry is mentioned in Paper Mario: Sticker Star in World 5-1, Shy Guy Jungle. Before the player places the goat, a letter can be found from him. The letter says, "Thank you for your letter. Sorry I'm not here to receive it, but I will get back to you shortly. Thanks. - Parakarry"
Parakarry appears in a short chapter in volume 26 of Super Mario-Kun. After deliveries to a Whacka, a Lava Bubble, and a giant fish, Parakarry interrupts Mario, Goombario, and Kooper's adventure by delivering mail sent by Goompa to Goombario. Soon, a sign reveals itself to be a Paragoomba that steals Parakarry's mailbag, annoying Parakarry. Then, a group of Paragoombas attack Parakarry. Kooper attempts to help by throwing Mario from a slingshot, but fails. Parakarry then loses his wings. Goombario has Parakarry eat the item that Goompa sent. The Paragoombas then kick the mailbag, letting loose the mail. Parakarry gets angry and has his wings suddenly reappear. Parakarry, powered from the item, dive bombs into the Paragoombas, defeating them. Soon, Parakarry happily flies away, forgetting his mailbag, but Mario reminds him of this fact, and because of this, Parakarry comically falls. Card Description: Parakarry earned his fame from the original Paper Mario. He's the most fearsome mail carrier of them all! Paretta Corruption of Patapata, Paratroopa's Japanese name. Italian Koopostino From "Koopa" and "postino" (postman). Parakarry is currently the only one of Mario's partners to appear in the most Paper Mario games, whether it be a direct appearance, a cameo, or a simple mention. This streak, however, has stopped as of Paper Mario: Color Splash. In Paper Mario, if Parakarry is Mario's partner when Mario obtains Yakkey from Tubba Blubba, his response to Yakkey is in "wavy" text, which usually indicates panic or fear. He is the only partner in which this occurs. At the end of Paper Mario, Parakarry leaves Mario as other partners do, but he forgets to take the undelivered letters (if there are any). This is implied by the existence of the remaining letters in the "Key Item" list on the pause menu. 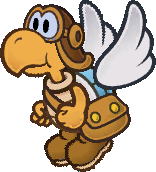 He is the only notable Paratroopa in Paper Mario: The Thousand-Year Door to have a speaking role, even if it's a minor one. This page was last edited on January 20, 2019, at 22:25.